Barnard, Vermont Fire Department- is in the process of building a new fire station. Barnard, Vermont Fire Department- Fire Chief saves station from fire. CLICK FOR ARTICLE. 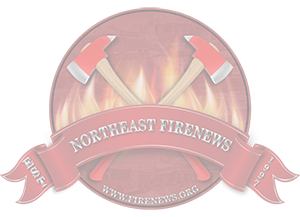 Bellows Falls, Vermont Fire Department- has hired Call Deputy Chief Shaun McGinnis as the full-time Fire Chief. Bradford, Vermont Fire Department- has received a Federal grant in the amount of $113,694 for Firefighter Breathing Apparatus. Brattleboro, Vermont Fire Department- is now operating out of their new West Brattleboro Station. The new station was built at the site of the former station at 16 South Street. Champion Fire Company of South Londonderry, Vermont Fire Department has been awarded a Federal grant in the amount of $84,096 for Firefighter Breathing Apparatus. Derby Line, Vermont Fire Department- has acquired a used International/Marion heavy rescue. Designated Rescue 2, it replaces a Chevy/Gerstenslager rescue. Dorset, Vermont- fire departments discuss merger. CLICK FOR ARTICLE. Essex, Vermont Fire Department- has sold their 2008 KME to the Unionville, NY Fire Department. It was replaced by a 2017 Pierce Arrow XT. Ferrisburg, Vermont Fire Department has been awarded a Federal grant in the amount of $76,762 for 13 – Firefighter Breathing Apparatus. Franklin, Vermont Fire Department- has received a Federal grant in the amount of $50,186 for Firefighter Breathing Apparatus and a Thermal Imaging Camera. Glover, VT Fire Department- has acquired a 1997 Pierce 1250/750 four wheel drive engine from the Chicora, PA Fire Department. Grand Isle, Vermont Fire Department- breaks ground on new fire station. CLICK FOR ARTICLE. Grand Isle, Vermont Fire Department- has received a Federal grant in the amount of $80,000 for 12 - Breathing Apparatus. Middlebury, Vermont Fire Department – has received a Federal grant in the amount of $219,223 for Portable and Mobile Radios. New Brook, Vermont Fire Department- has received a Federal grant in the amount of $93,334 for 14 – Firefighter Breathing Apparatus. Pawlet, Vermont Fire Department- has received a Federal grant in the amount of $72,381 for Firefighter Breathing Apparatus. Pittsford, Vermont Fire Department- has placed into service a 2016 Ford F-150 Super Crew Pickup Truck assigned as Utility 25-44. South Burlington, Vermont Fire Department- Captain Gary Rounds has retired after 47 years of service. South Hero, VT Rescue- remounted the 2008 Osage ambulance body to a new 2017 Ford F-450 4x4 chassis. Springfield, Vermont Fire Department- has been awarded a Federal grant in the amount of $260,000 to purchase new air packs. Stamford, Vermont Fire Department- has received a Federal grant in the amount of $14,191 for an Air Refill Station. Stowe Mountain, Vermont Rescue- gets grant for new equipment. CLICK FOR ARTICLE. Vermont Firefighting Academy- has received a Federal grant in the amount of $426,925 for Firefighting Equipment and Protective / Turnout Gear. Waterbury, Vermont Fire Department- has acquired a 2000 KME 2000/500/95' mid-mount tower from East Norwich, NY. Designated Tower 1, it replaces the Pierce/Sutphen tower. West Dummerston, Vermont Fire Department- has received a Federal grant in the amount of $40,000 for 3 – Thermal Imaging Cameras. Williamstown, Vermont Fire Department- Engine-Squad 3's 2000 HME/V-Tec 1750/750 was invovled in a roll-over MVA. Fortunately no one was injured, although it is believed the damage to the truck is extensive. Williston, Vermont Fire Department- has placed into service a 2017 Chevy Tahoe as Car 1. Winooski, Vermont Fire Department- has promoted John Audy Jr. to the rank of fire chief and John Spittle to Battalion Chief.